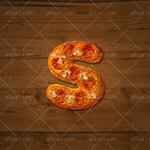 Learn how to create 3d fast food text effect and get food alphabet layered PSD file. 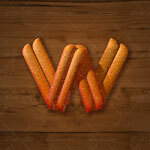 Web and Graphic Design Services. 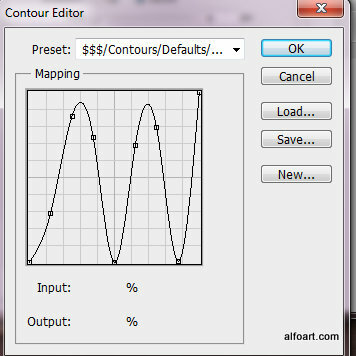 All content on Alfoart is 100% original. 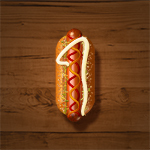 Your e-mail has been added to our mailing list! 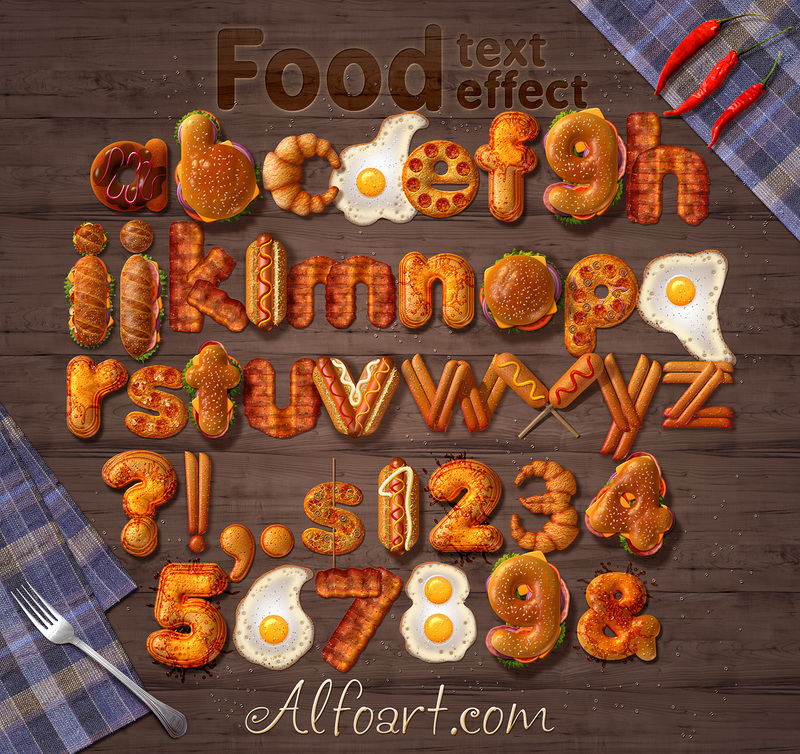 Food Text Effect. 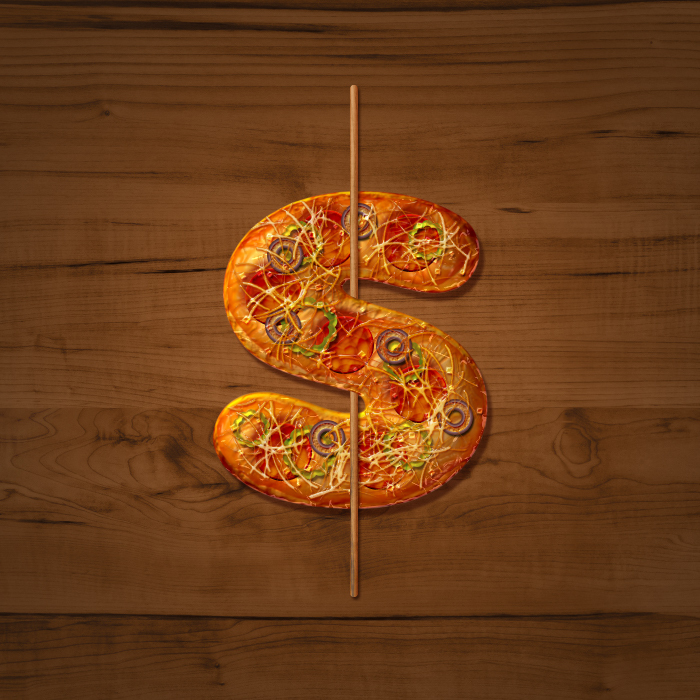 Different Kinds of Meals 3D Letters. 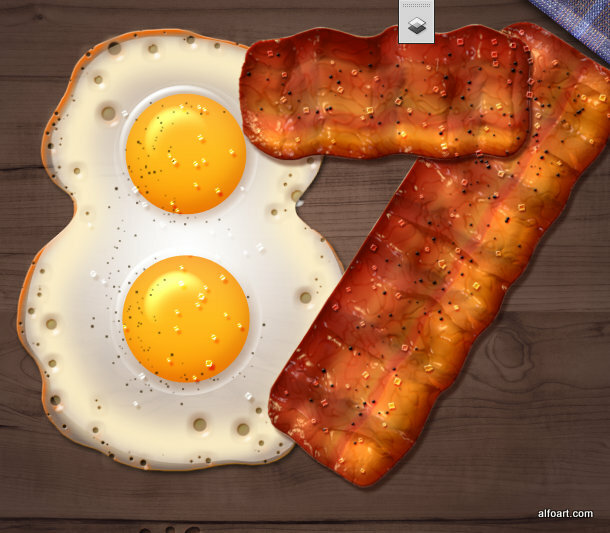 Fried Eggs and Bacon. 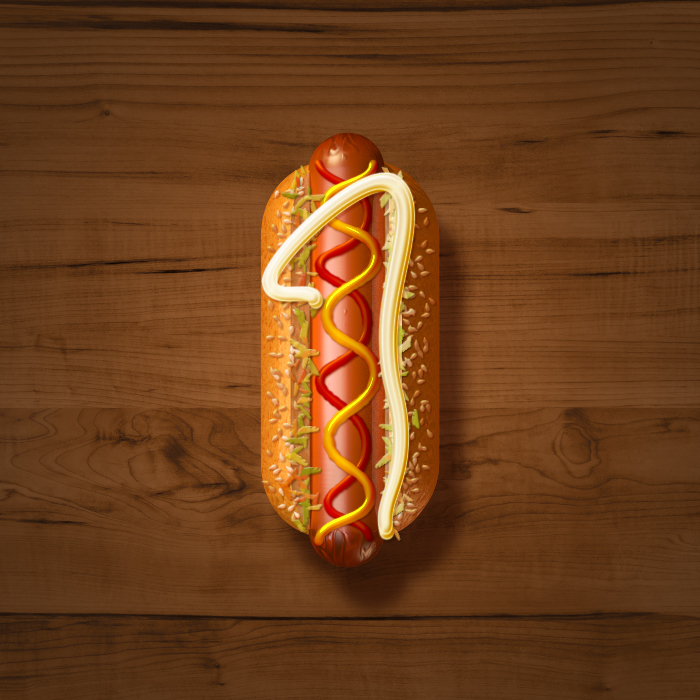 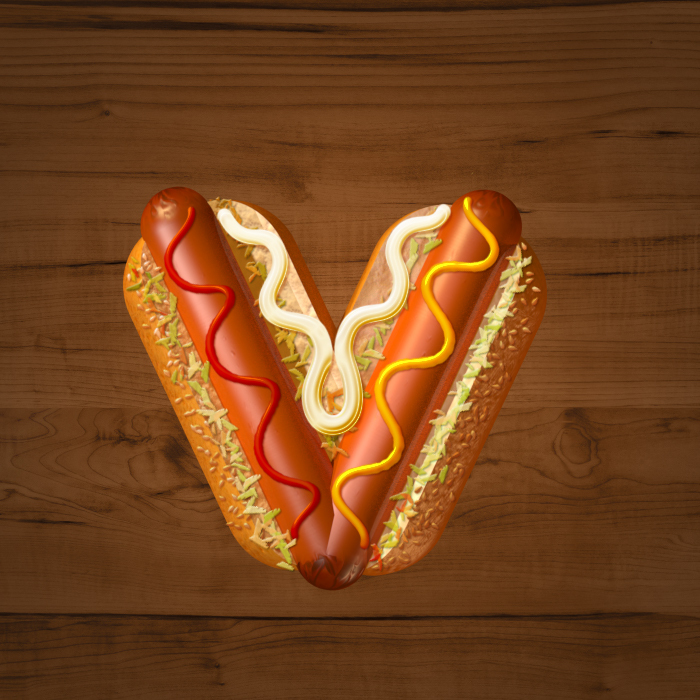 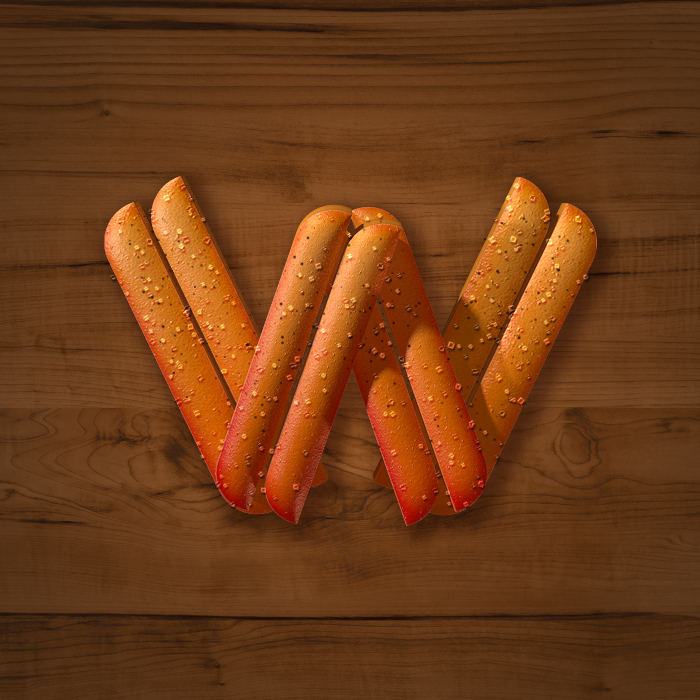 Learn how to create 3d food text effect. 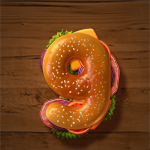 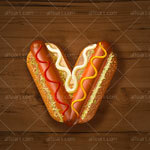 This Adobe Photoshop tutorial teaches how to apply food textures and light reflections to the 3d letters. 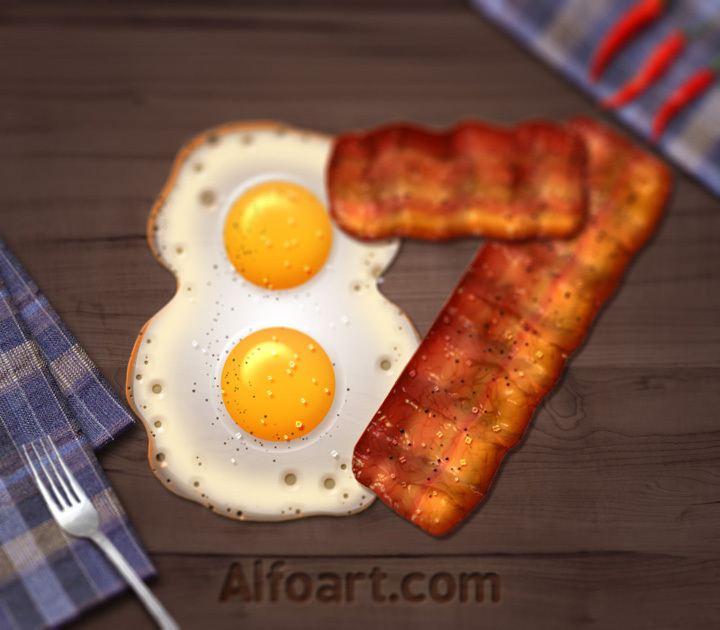 You may get large (2.6 x 2.3 in, 300px/in) editable .psd* file of "Bacon and Fried Eggs tutorial" Photoshop tutorial + large (11.6 x 11 in, 300px/in) .psd* file of "Food Text effect Alphabet" which includes all English letters and 1-9 numbers in separate layers. 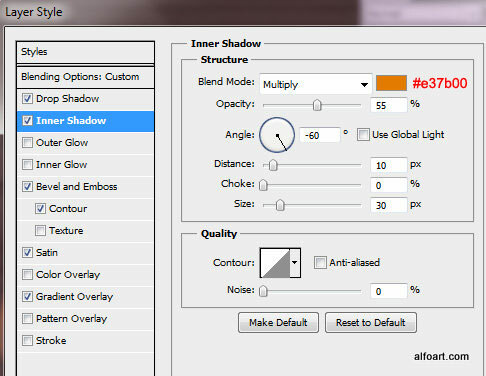 Each letter contains separate letter layer + shadow layer. 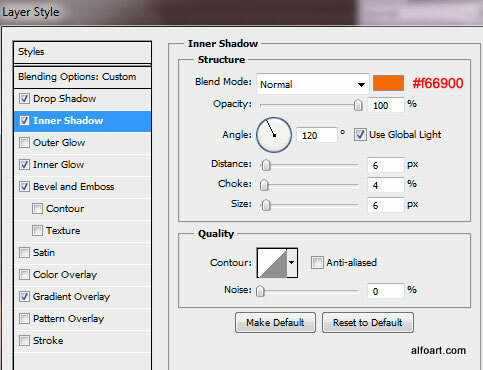 You will be able to remove or change shadow effect. 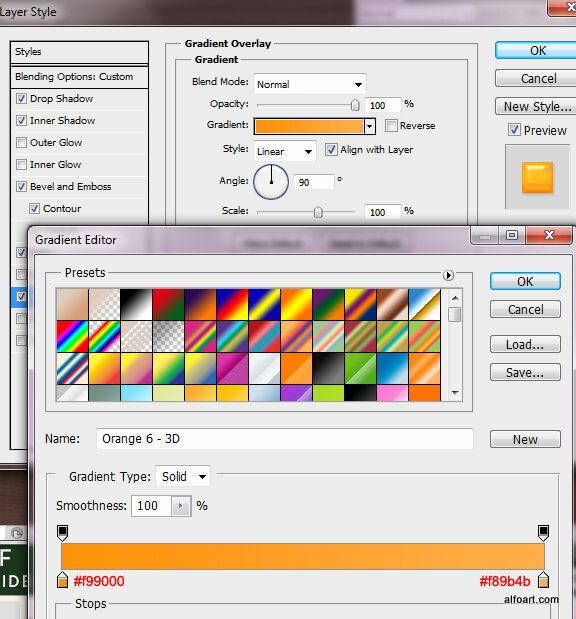 Create a new Photoshop document 800 x 700px, and resolution - 300px/inch. 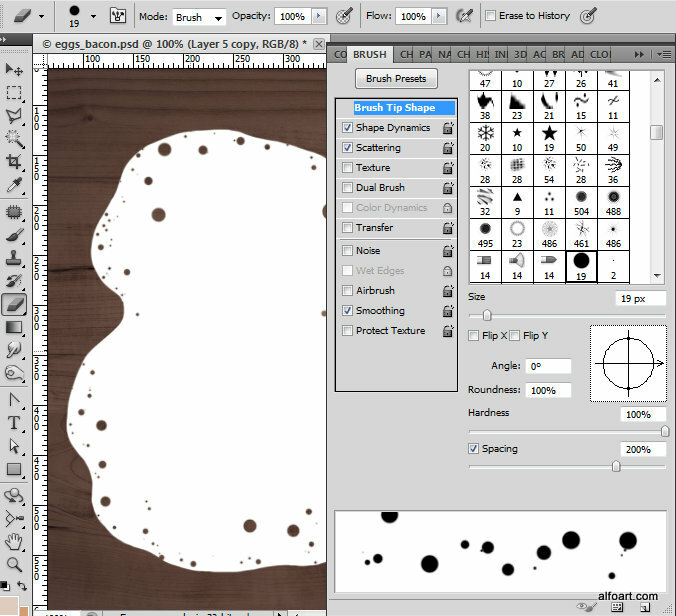 The layer style effects for the letters depend on the shapes size and resolution. 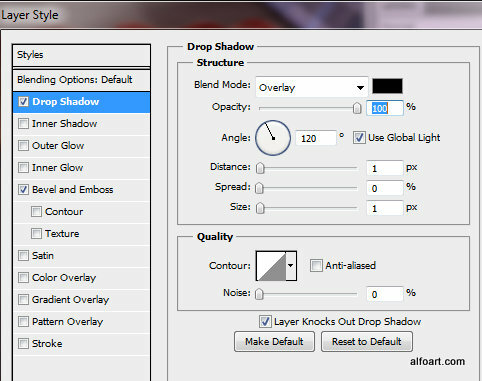 Create the eggs silhouette shape in a new layer with the large round brush. 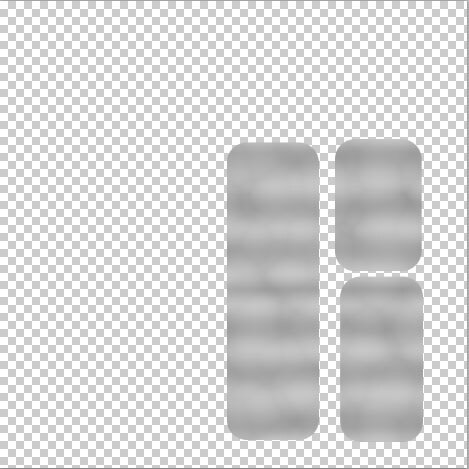 The size of the shape below is around 325 x 430 px. 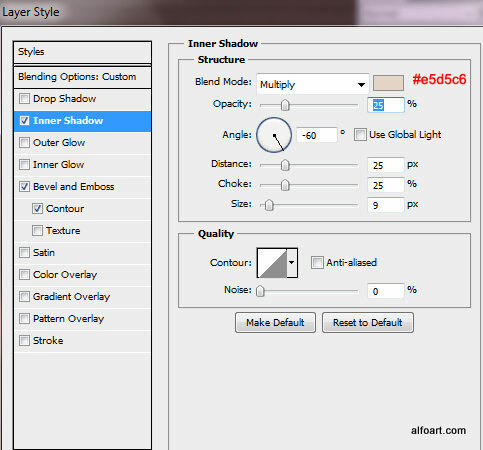 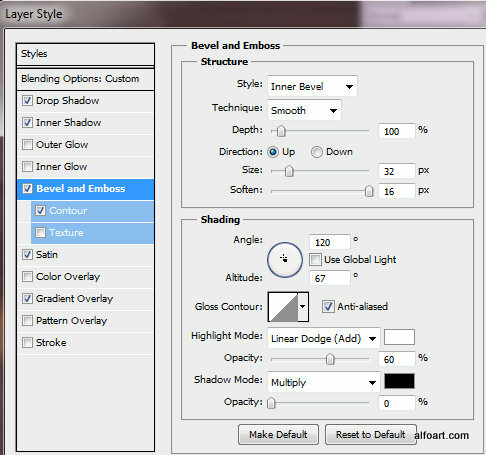 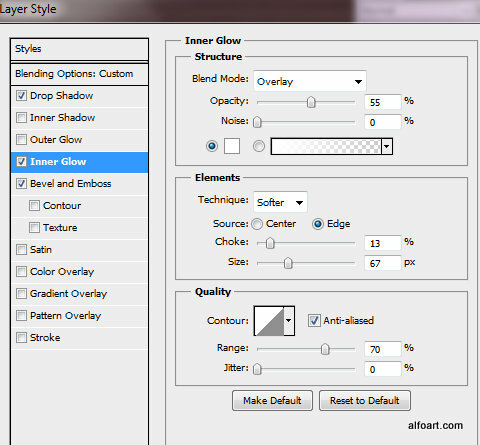 Choose Eraser Tool (round shape with Dynamic/Scattering effects). 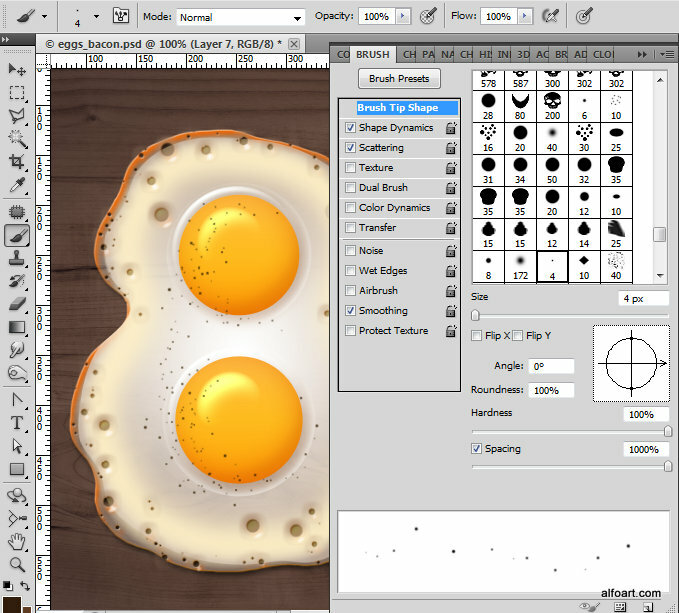 You may download eggs brushes here. 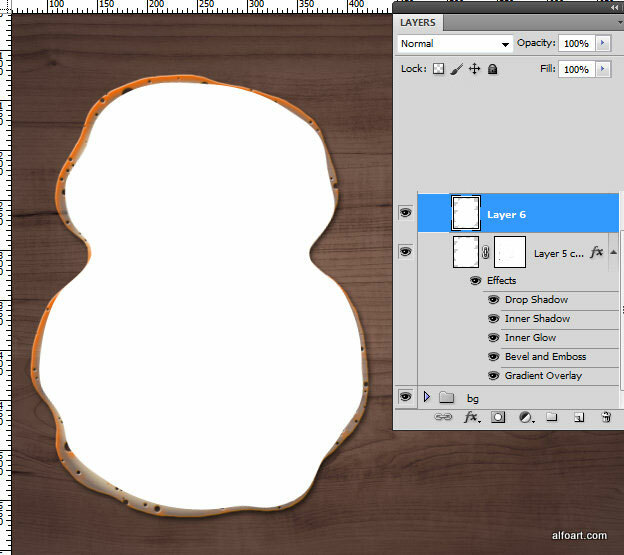 Create a new layer and draw very similar shape to the previous one, but little bit smaller. Apply Fill = 0% and layer style effects. 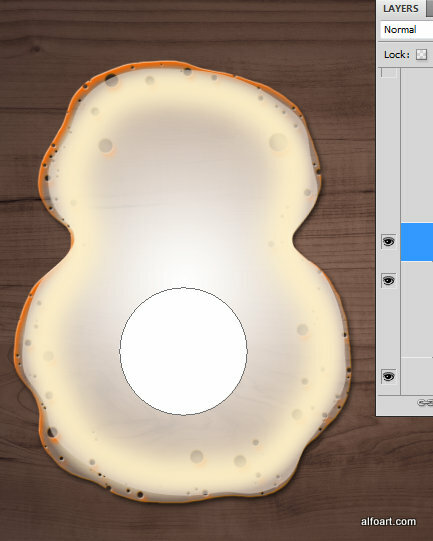 Create a yolk shape in a new layer, use Ellipse Tool. 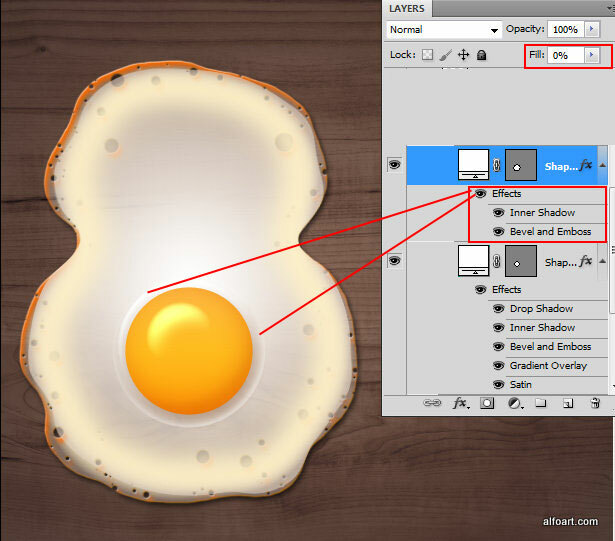 In order to get very similar layer style effects, the size of yolk has to be ~ 130 x 130px. 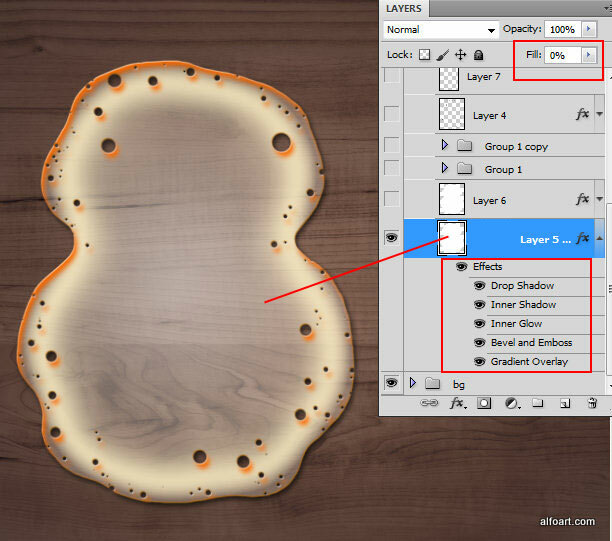 Choose Brush Tool with the scattering effect, you may use the same brush as for the first layer bubbles effect. 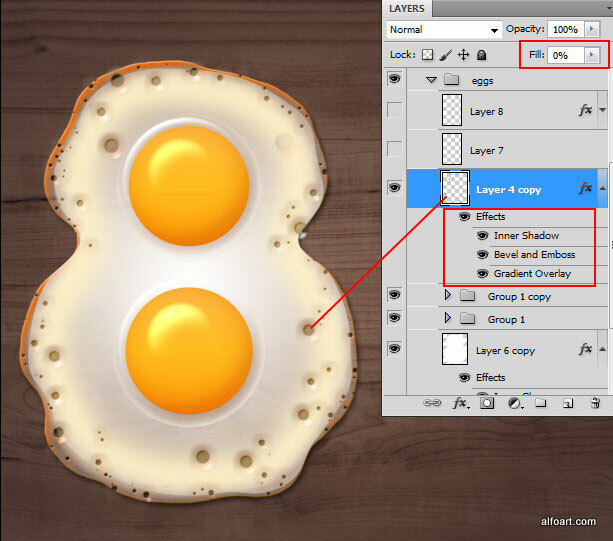 Create a new layer and draw some bubbles close to the egg edges. 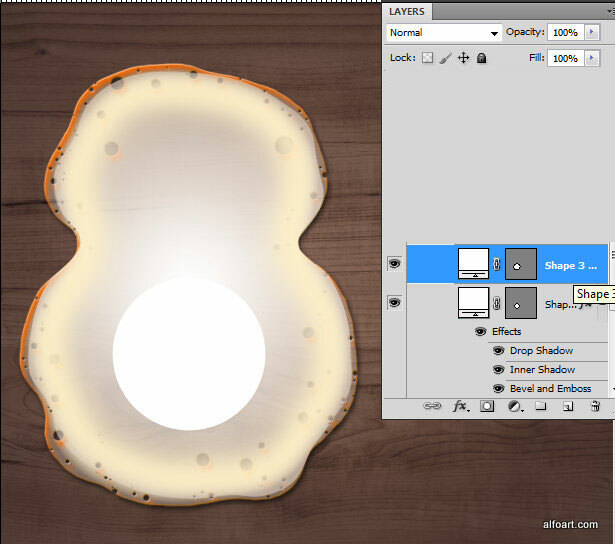 Erase the bubbles outside of the eggs silhouette. 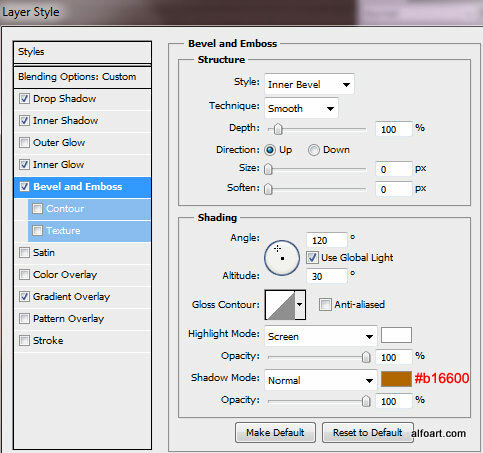 Use the small scattering dark color brush to create black pepper effect. 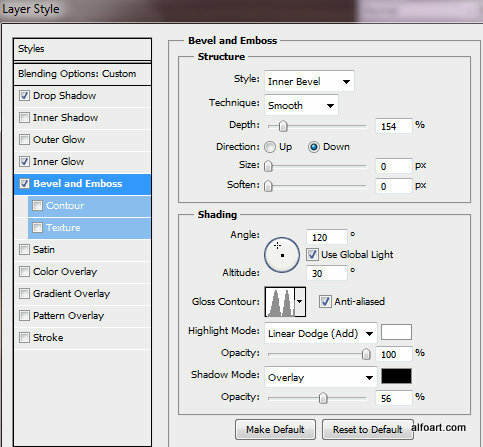 You may find this brush in "Help files" list on the first page of tutorial. 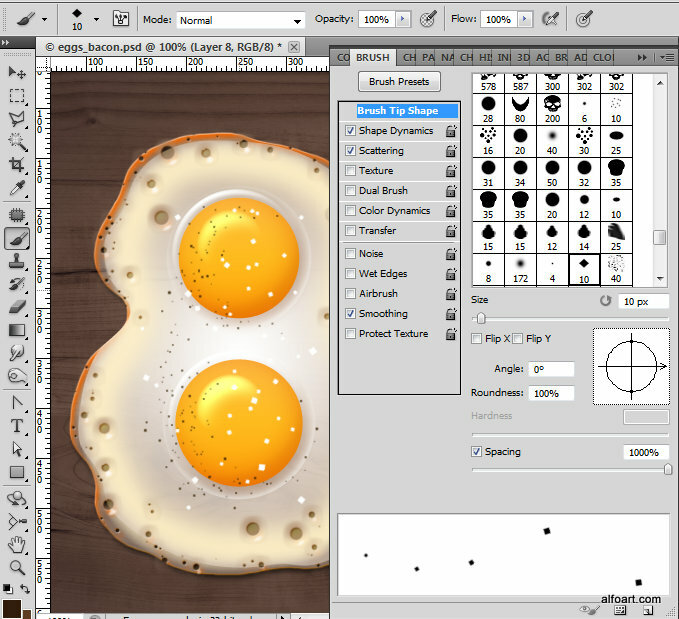 The same "eggs" brushes set file includes another brush to create salt effect. 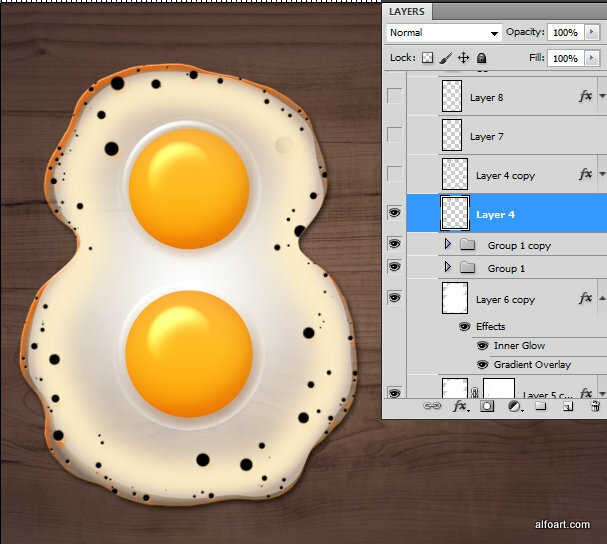 The eggs layers are done. 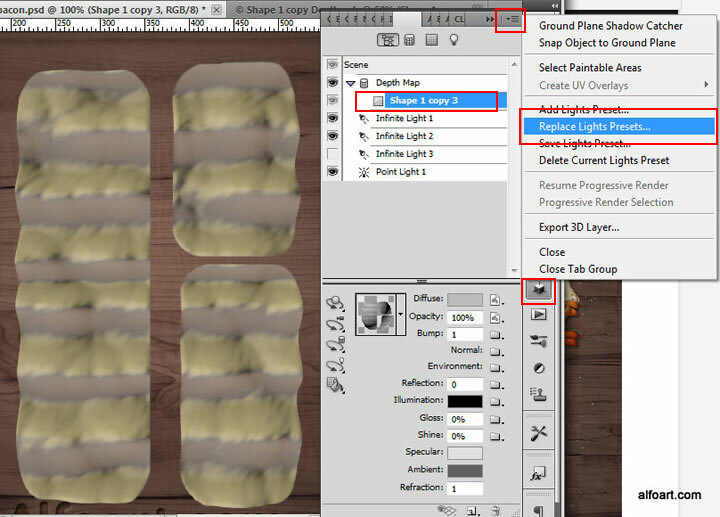 You may group them and make invisible for a while. 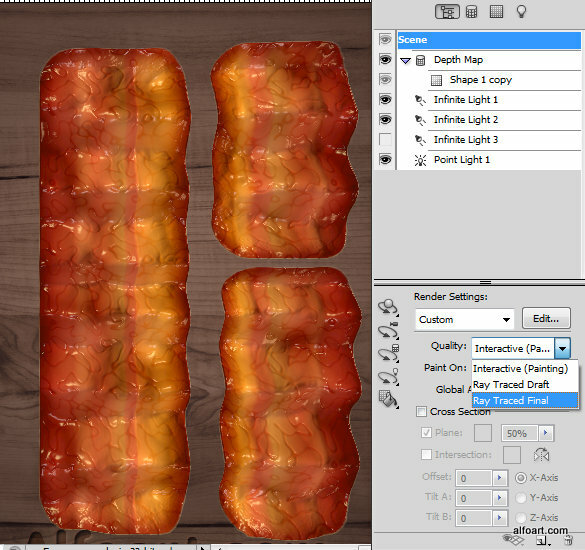 Use Rounded Rectangular Tool in the Shape Mode to create bacon strips. 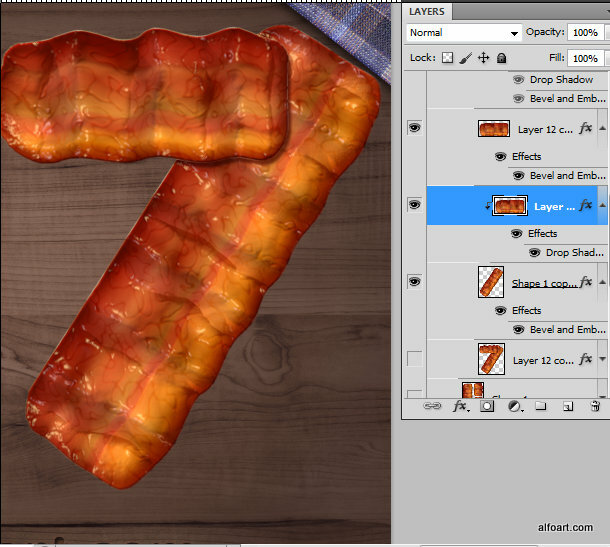 I've created 3 strips of the bacon to use them to combine them for different letters & numbers shapes. 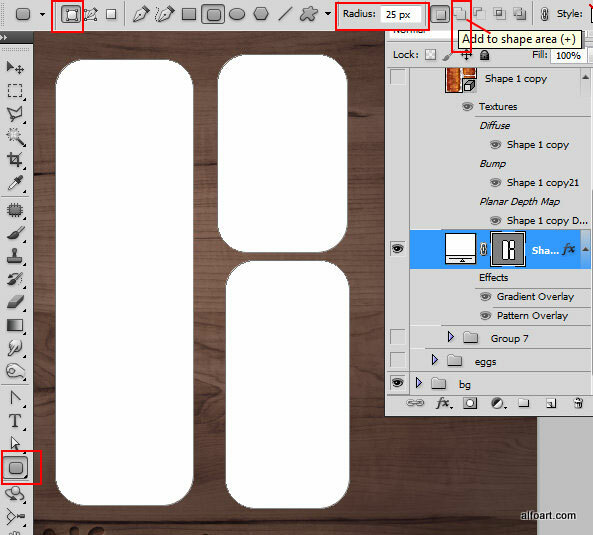 Make active "Add to shape area" mode, to add 2-nd and 3-rd strips to the same layer. 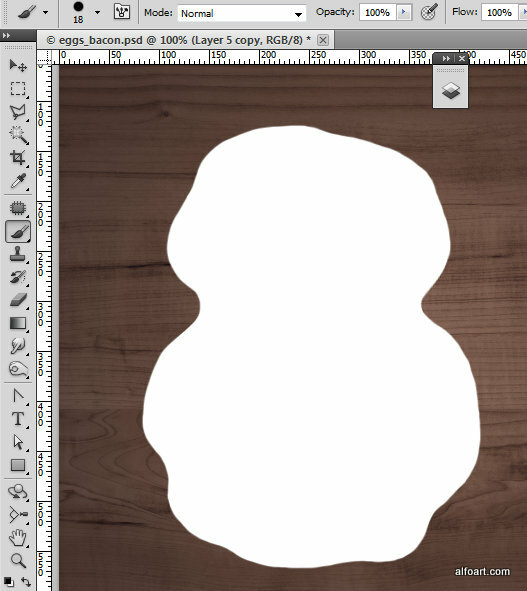 The whole size of these 3 shapes is around 300 x 450px. 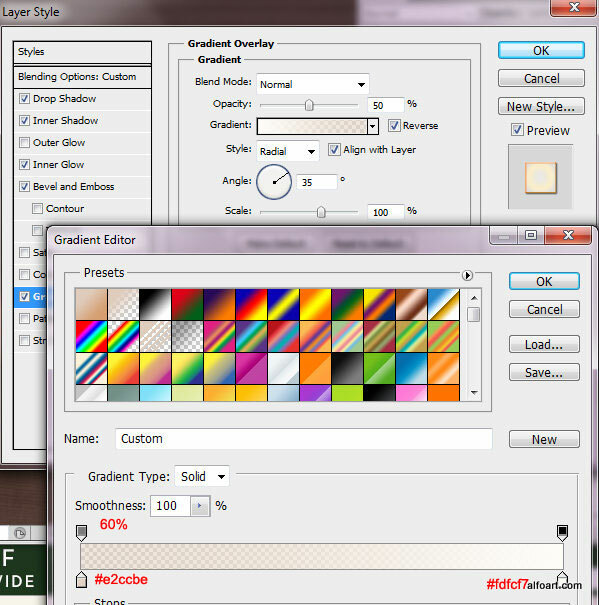 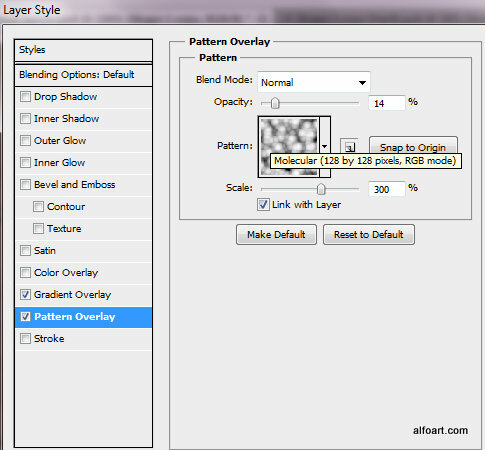 Apply layer style effects just like on the screen shots below to get a "Grayscale Mesh". 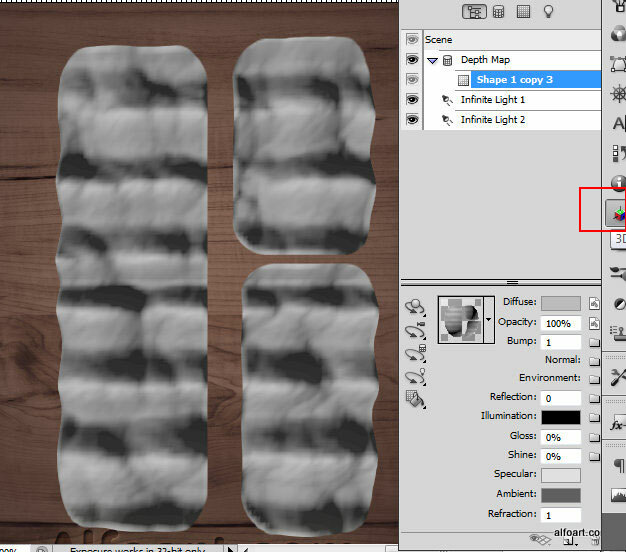 This gray texture will be used to create bacon "wave" effect. 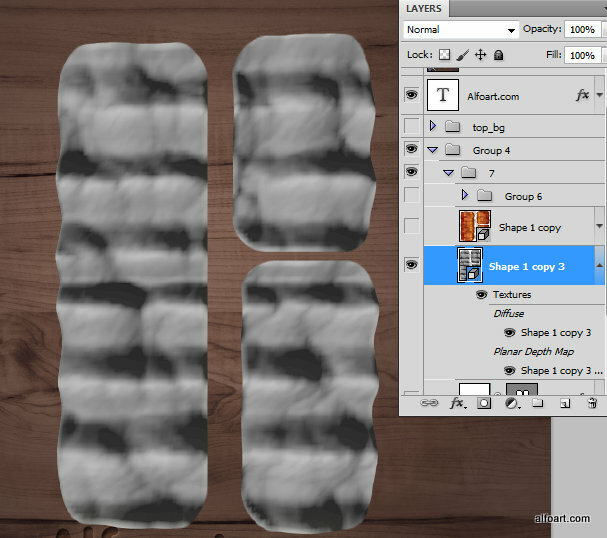 The dark areas of texture will be deep parts of "waves" texture and light areas will be embossed parts. 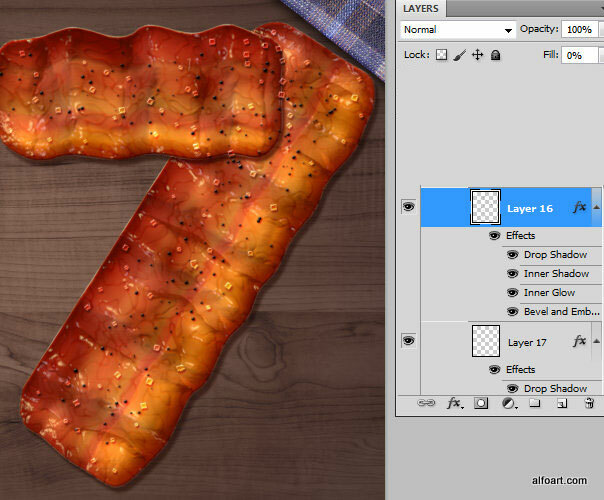 You may find these effects and some others bacon textures and layers in this file. 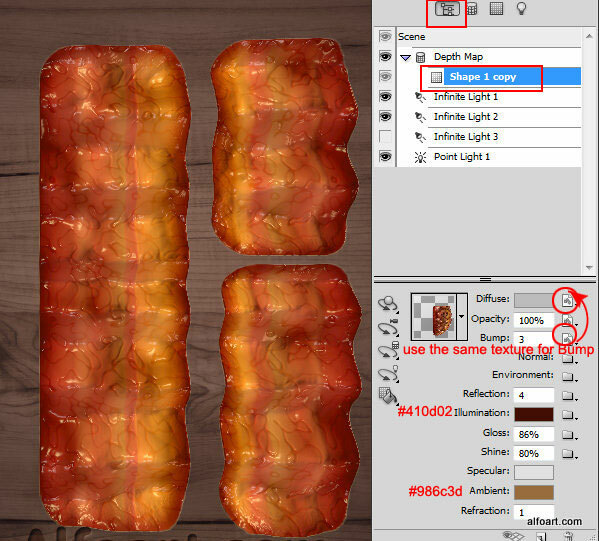 Make active path thumbnail of bacon shape. 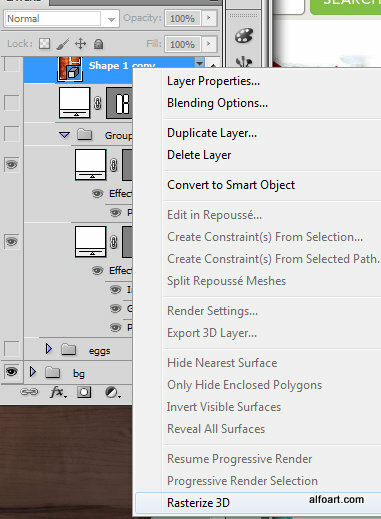 Go to 3D > New Mesh From Grayscale > Plane. Here is the result of applying 3D effect. 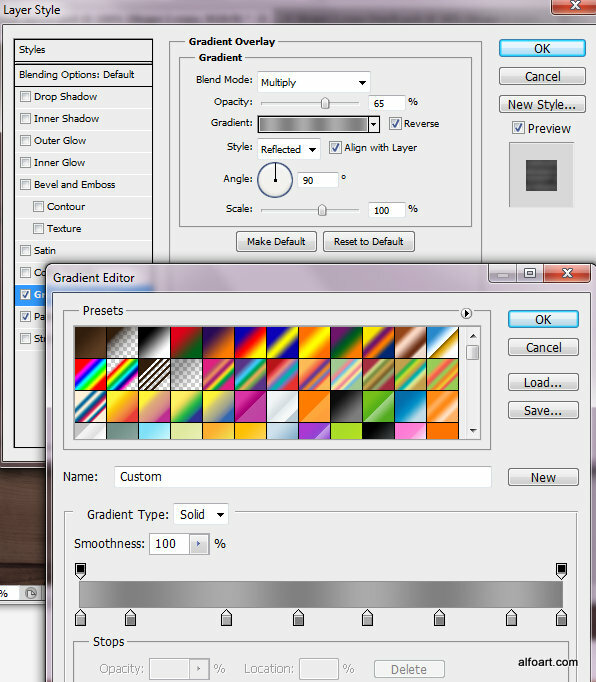 Here are the default 3d settings of Grayscale Mesh. 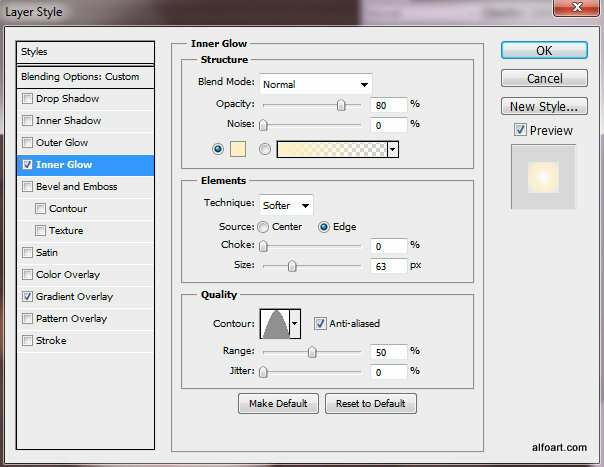 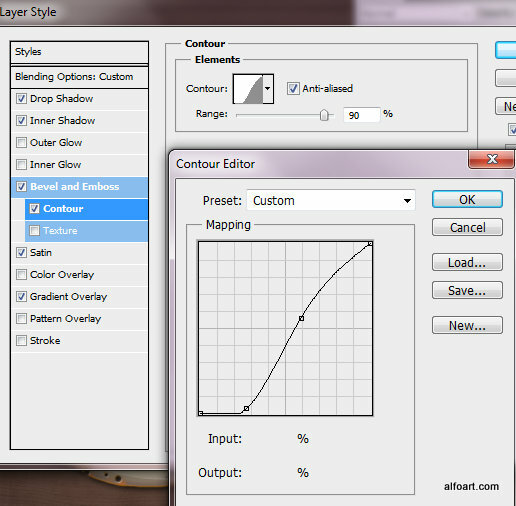 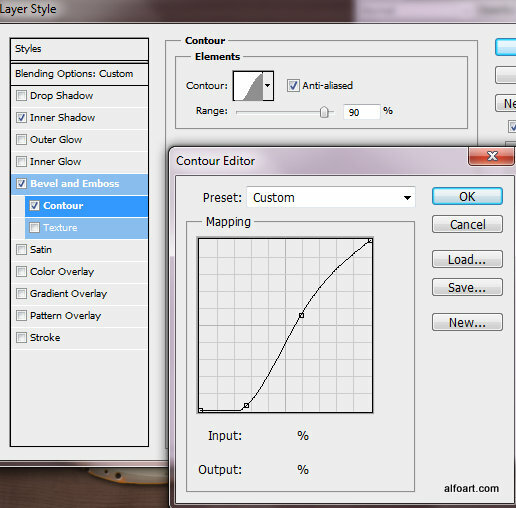 Click current Diffuse texture icon and choose "Open". 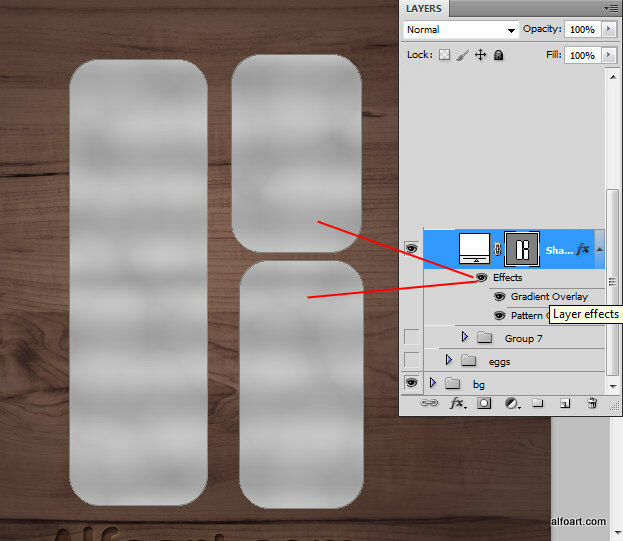 The texture has to open in a new document and it has to be look like the gray mesh we created previously. 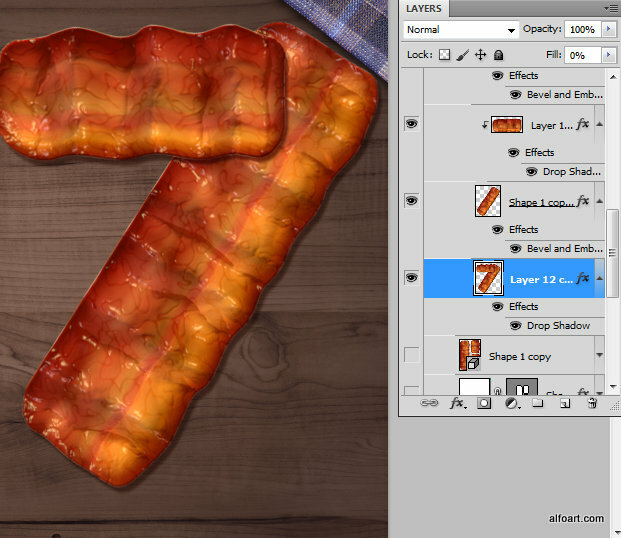 Duplicate the bacon shape layer inside of the "diffuse" texture document (which opened in a new window). 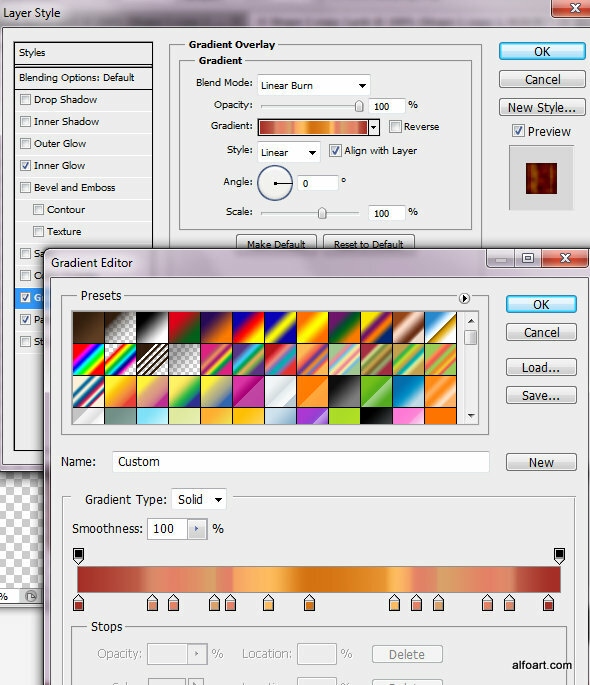 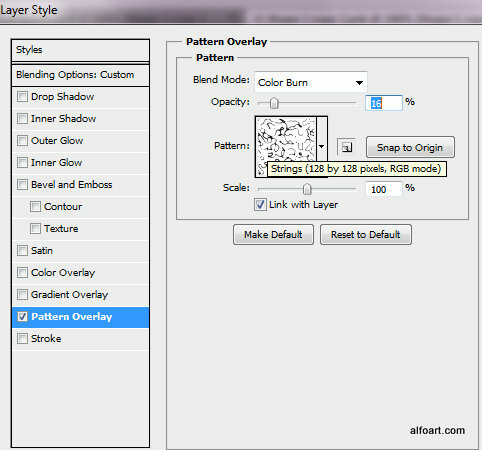 Apply new layer style effects to these duplicated layers (see screen shots below). 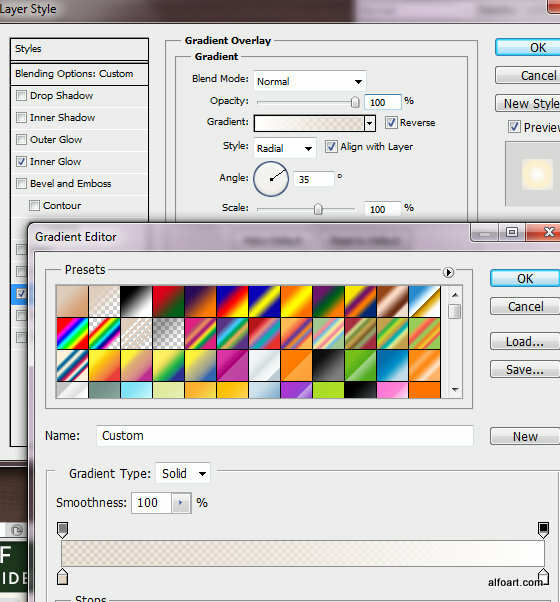 You may see all layer style settings in this psd file, also you may download gradient and patterns used here. 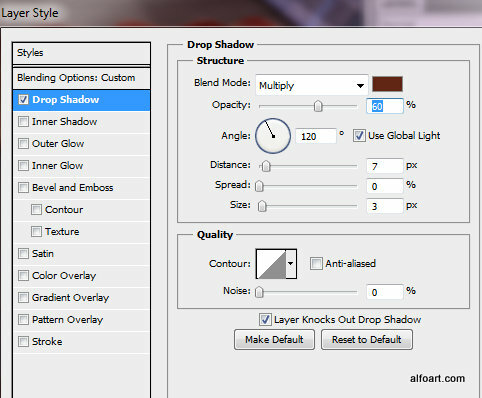 After applying all these styles go to File > Save. 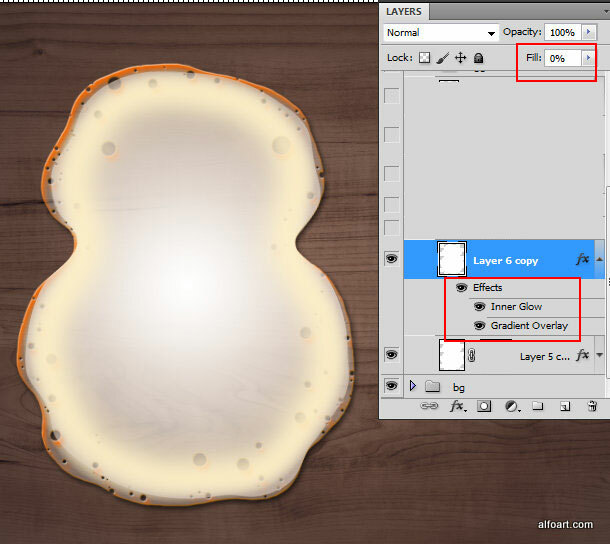 You will see the result of changes in the main file automatically after saving "Diffuse" texture. 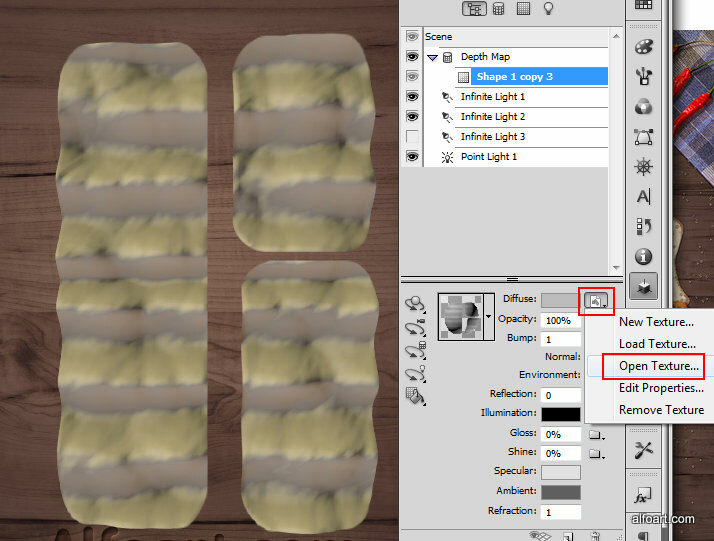 Return to the saved "Diffuse" texture, go to File > "Save as" and save this new texture as a separate file (with the name "Bump", for example), we need this action for the future step. 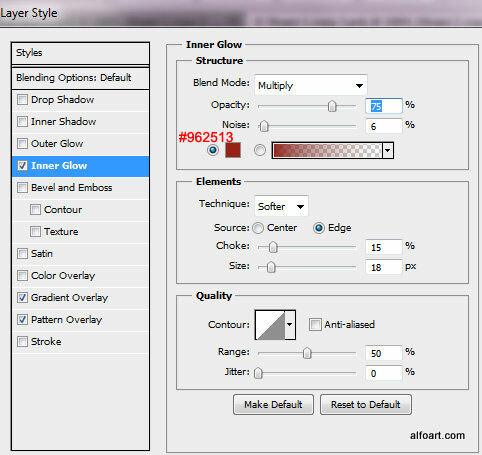 Return to the main document. 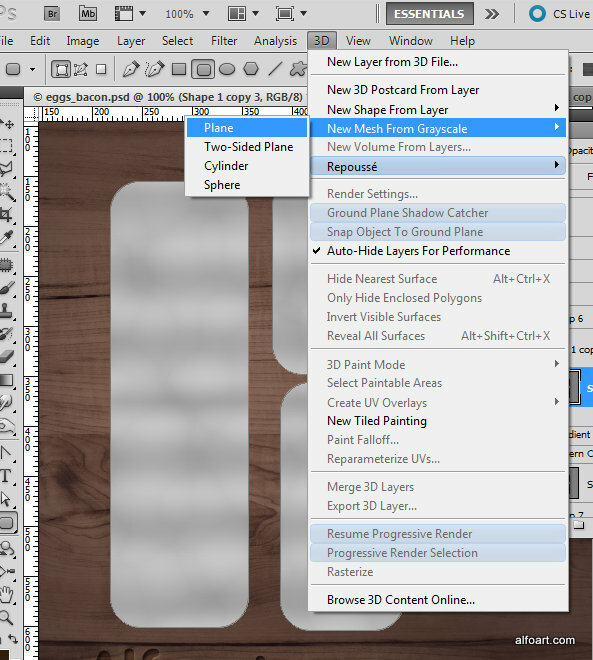 Open 3D material settings panel. 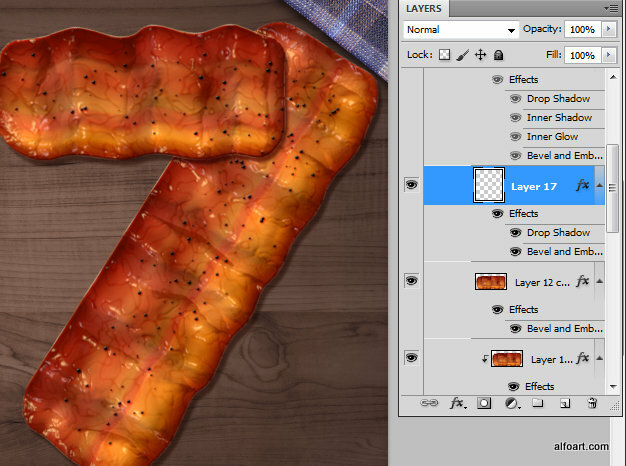 Apply following settings for the bacon material. 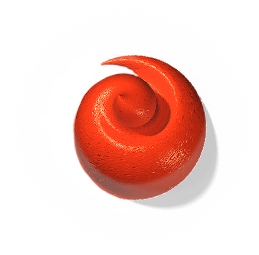 For the "Bump" upload the same texture as for "Diffuse", we saved it previously as a "Bump". 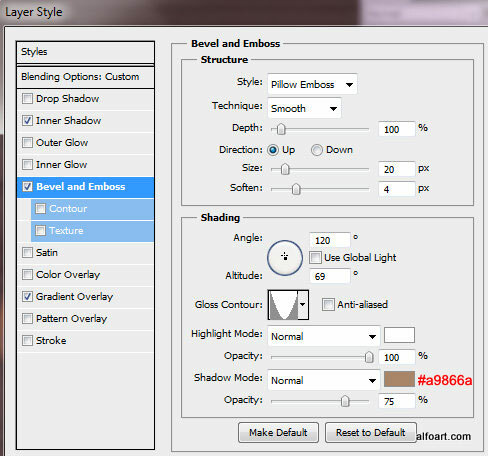 Choose "Ray Traced Final" after applying all 3D adjustments. 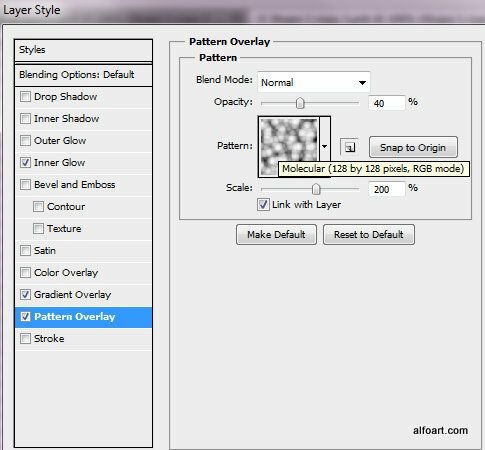 Rasterize 3D layer after all. 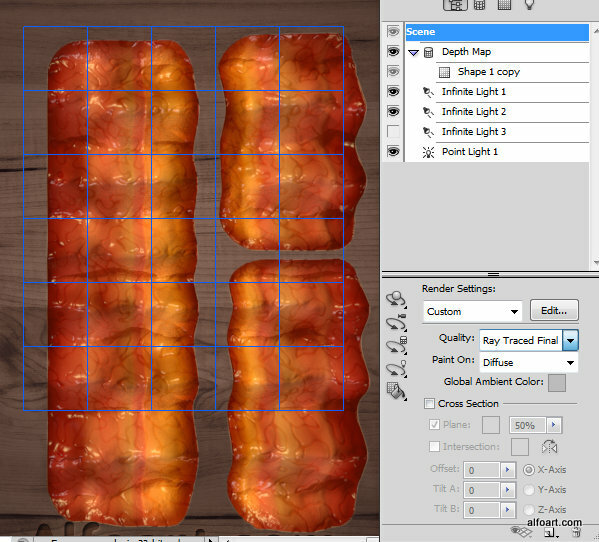 Then you may select and cut the parts of bacon rasterized layer. 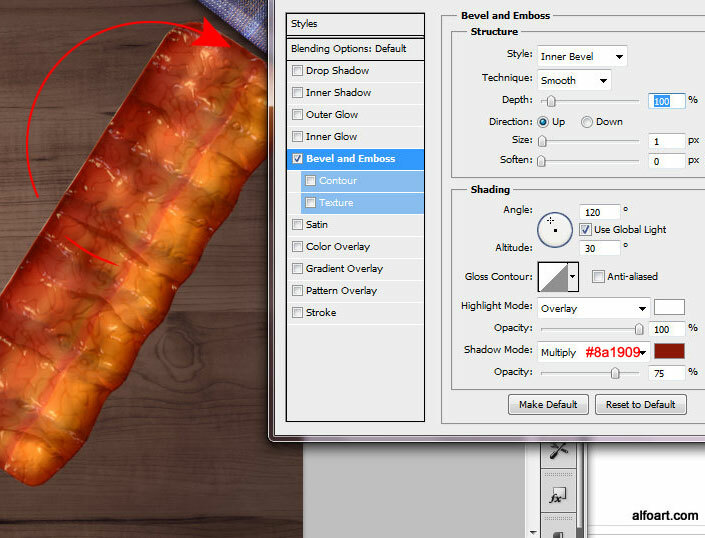 Apply "Bevel and Embossed" effect to the parts to highlight the shine side of the strips. 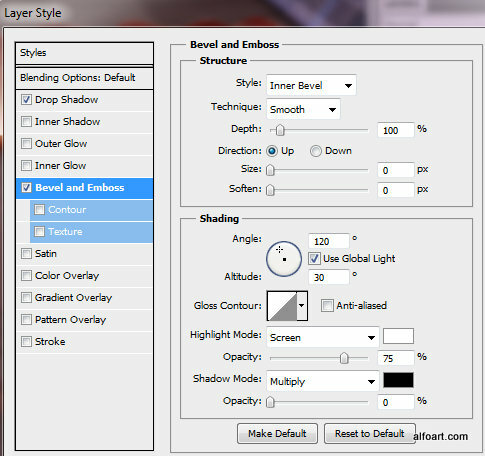 Rotate them as needed. 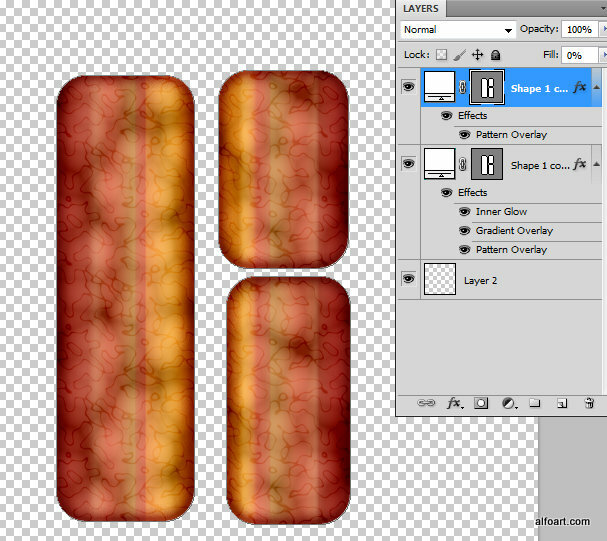 In order to create drop shadow effect from the top bacon strip to the bottom, duplicate the top one. 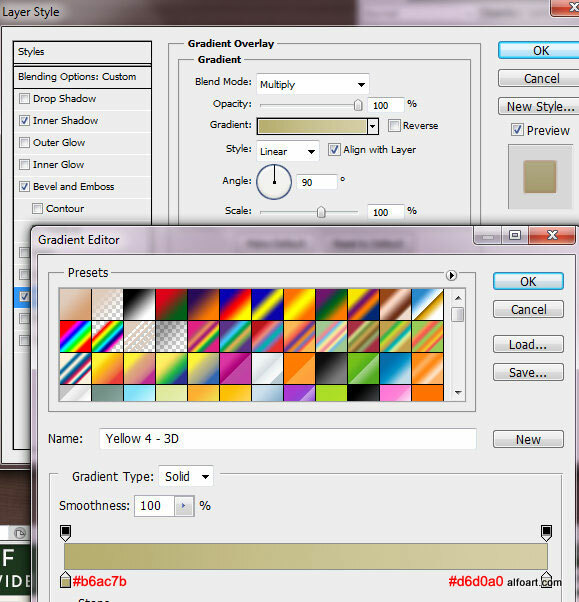 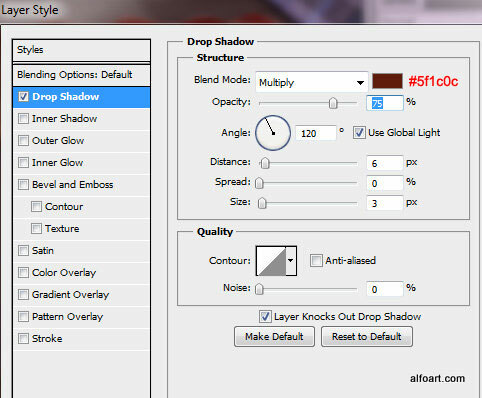 Convert bottom duplicate to the Clipping Mask for the layer below (right click layer and choose "Create Clipping Mask"). 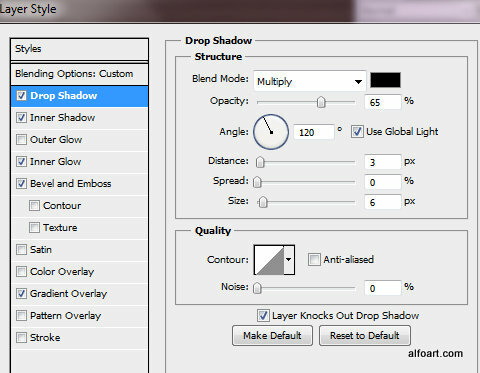 Apply drop shadow effect to the Clipping Mask. 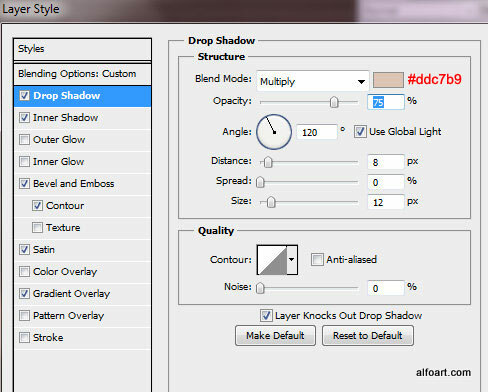 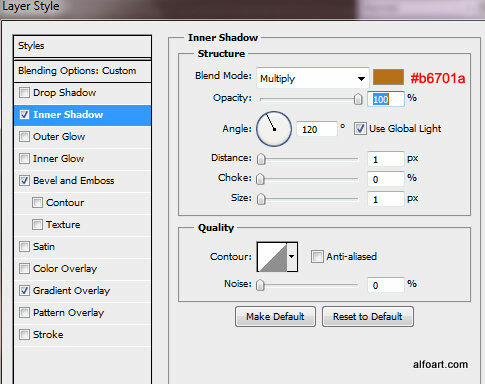 To apply shadow effect for the all shape, duplicated all bacon layers, merge the bottom duplicates and apply "Drop Shadow" layer style effect to the merged layer. 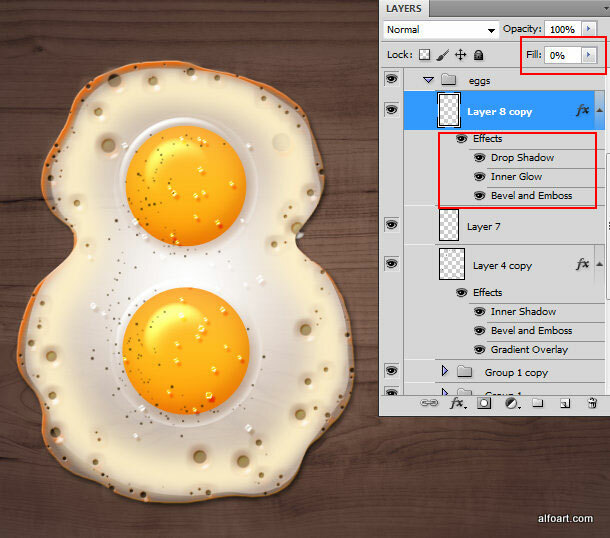 Create pepper effect wit the scattered brush using the the same way as for eggs. 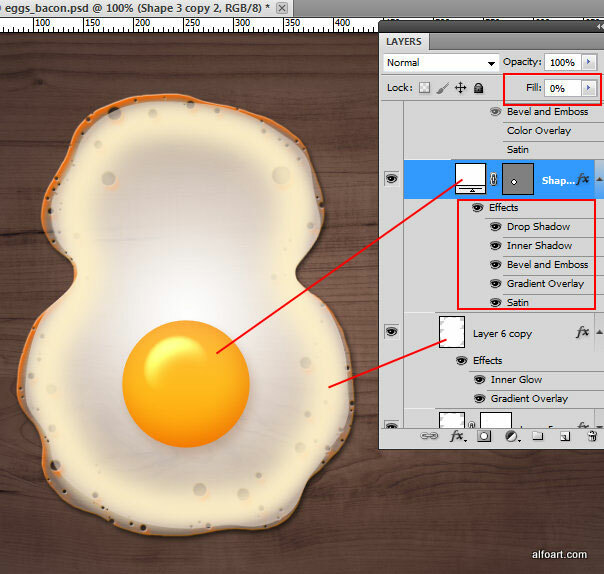 Create salt effect using the same instructions as for the eggs. 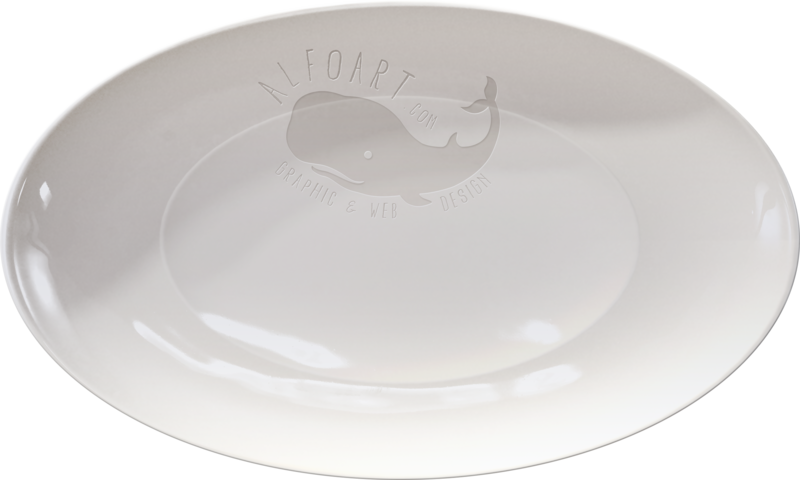 Welcome to the Alfoart. 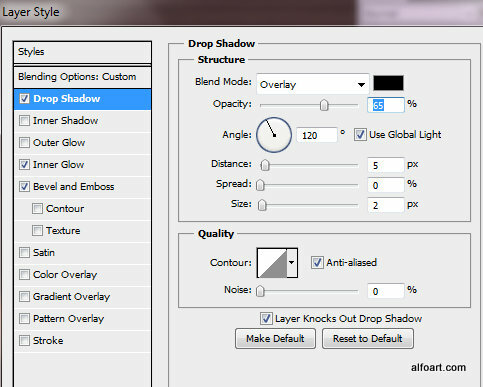 Photoshop Tutorials presented on Alfoart.com is a good free educational tool. 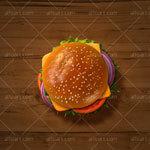 You may find here different digital art and graphic design techniques, also creative ideas and useful tips for your project.